Although 2012 was a dismal year for my garden, for some reason it was a fabulous year for fruit. The abundant success of our fruit and nut trees, which require much less watering and care than annual vegetables, has rewarded us for the years of faith and patience that it took for the trees to grow large enough to bear fruit. Now that they have, I’m just trying to keep up with them. My husband and I began planting our micro-orchard in 2006 on a mid-sized lot in an inner suburb in Oklahoma City, not bigger than a third of an acre. We planted three apples, two pears, two peaches, three plums, a persimmon, a fig, and a cherry. Towering above them all is a fifty-year old pecan tree. We pruned and thinned and watered our trees through the drought of the last three years (aside from the cherry, which perished, and the fig, which we are half-heartedly trying to kill). In 2012, we began to witness the amazing amount of fruit that a small orchard in the middle of a city can yield. It began unexpectedly in May, with our first-ever bounty of plums. These were quite tart, so they were made into jam and given away to our friends in the resilience team we have jokingly dubbed "Plan T."
In June (about four weeks earlier than usual), we had an impressive peach harvest -140 pounds from two semi-dwarf trees. One of our friends was kind enough to help us by trading two hours of thinning in return by a home-cooked sirloin steak dinner. 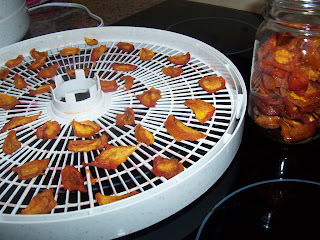 We ended up with peach chips, peach pie filling, peach jam and more fruits to our family and friends. Around this time, our Plan T friends at Rose Ranch Jones called us to their farm for some free blackberry picking. After some prickly pain and sweat, we froze a lot of blackberries for blackberry pancakes and made some blackberry jam, perhaps my favorite home-made variety yet. Next, our first-ever harvest of pears and apples. Admittedly, we only got two pears, as the majority dropped off before I realized they were ripe. We did pick 30 pounds of apples, augmented by a trip into Jones, OK, where a member of our Plan T group had a line on some apple trees that the owner did not want to harvest. We dried our share of apples (90+ pounds) into apple chips, which have become a staple of my son’s school lunches. In August and September, some non-perennial fruit: Orangeglo and Ali Baba watermelons and Rich Sweetness 132 mini-melons, from Baker Creek seed. Maybe about 150 pounds of watermelons were eaten and given away. 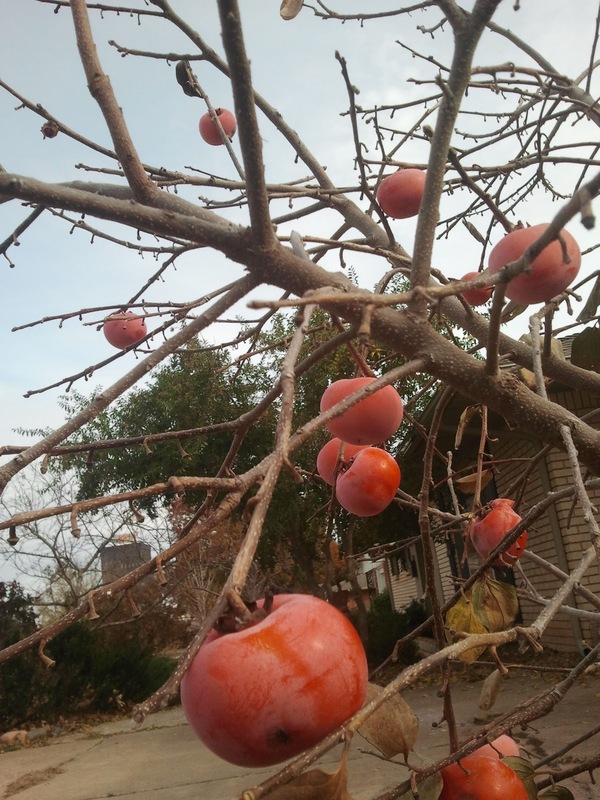 Toward the end of 2012, we got our first harvest of persimmons from our Asian-American hybrid, Nikita’s Gift. Persimmons seem to take forever to ripen – hanging on the tree until December – although (in my opinion) they are worth the wait, being as sweet as candy with a fun pudding-like texture. To top off the year, we harvested the first pecans we have had in five years (our last harvest was in 2007). We took most of the crop to be commercially cracked, to reduce the labor in shelling the pecans, reserving a few for my son, who for some masochistic reason, wanted to crack them with the Reed’s Rocket by hand. We ended up with over 80 pounds, plenty for snacks, potlucks and salads through the year. The generosity of the trees in our mini-orchard, and the friends in our resilience team, have reminded me that we need not grow a huge amount of our own food to participate in a thriving local food system – if we have a group of friends who are willing to barter, share, gift and trade. This comes as a relief, as I can’t seem to grow a tomato. Instead, my trees can take on the work of growing plums, pears, apples, peaches, persimmons, and pecans, and I can simply harvest and preserve their bounty, saving some for the pleasure of giving away.